Okayama is a pleasant and very livable-seeming (well, I had just come from Tokyo) city in the Kansai on the way from Osaka to Hiroshima.After I left Ushimado, I spent a night in Okayama before heading back to the wilds of Tokyo. Okayama is the prefectural capital of the like-named prefecture, and that government was the sponsor of the International Villas at Hattoji and Ushimado. Okayama prefecture clearly has a bunch of powerful Dietmen, because the evidence of rampant government spending is all over the prefecture -- whether it's the International Villas, the incredible number of nearly-unused highways crisscrossing the area, or the museums, they've got the funding. Another example of this is the Okayama Symphony Hall at left, a stunning but absolutely huge building in Okayama City. I'm sure they have nice concerts, though. 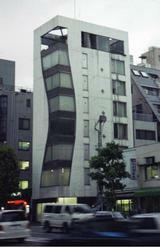 This building was a pretty cool take on how to build on the tiny plots of land available in Japan. The sun set while I was heading the OIC, leading to a pretty nice sunset. Across from the Kourakuen gardens island is the Yumeji museum, dedicated to the artist ??? Yumeji. He was supposedley one of the first artists to draw for popular outlets in the modern era -- he did book covers, pamphlets, comics, etc. (although he was active pre-war, so he wasn't part of the manga scene). He seems to have pretty much exclusively drawn beautiful women -- the image at left (from the admission ticket) is a detail from one of his more striking pieces. Since returning from Japan, I've seen him listed in some Japanese print catalogs. Okayama has a castle as well. It's very nice, and it's nickname is the "Black Heron." Especially nice is the view looking up at the castle shown at right; I spent about an hour sketching that as well. 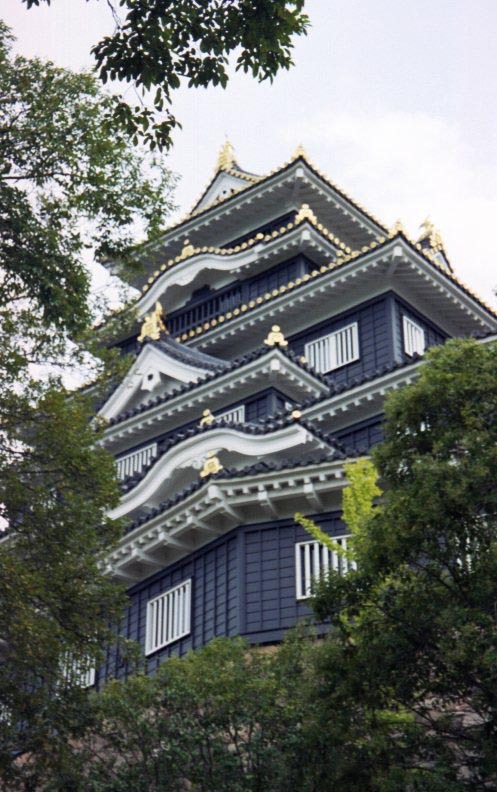 However, Okayama castle isn't quite as interesting as Himeji castle to me for two reasons: one, it clearly wasn't ever intended for real military operations in this incarnation; and, this one is a replica -- the original was destroyed by American bombing in WWII. I initially walked past the scene to the left. I got about 50 feet past it, then realized how special it was. So, I walked the 50 feet or so back, and lined up to take a picture of it. Whoops! 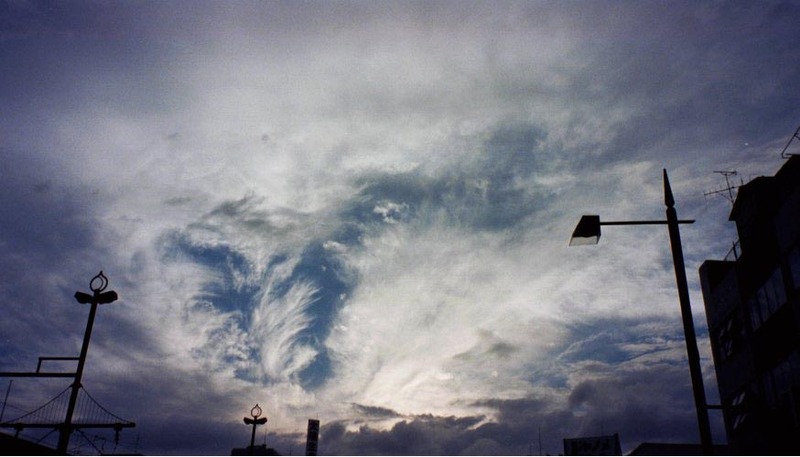 I was out of film. Rewind the film, remove it from the camera, fish around in the bag for the empty film case. Found it! Put that in, now fish around in the bag for the next roll of film. Find one, load it up. OK, finally get around to taking the picture -- and it's still there!